Description Nintendo DS emulator for windows. - Sprite support fixed. Homebrew demos with sprites should now start to work. 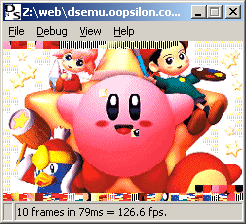 - Support for some 8 bit graphics modes with palletes. 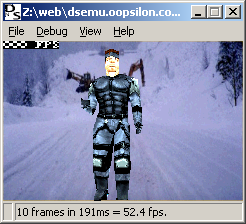 - Fixed crash that occurred occasionally in mode 5 rendering. 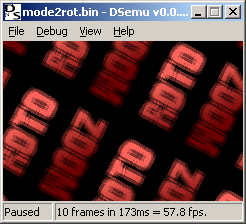 - Workaround for a thumb emulation bug that occurs with devkitpro r17 compiled programs (to be fixed properly in 0.4.11). - Fixed Thumb emulation bug the was occasionally causing black screens and crashes. - Fixed touchscreen bug that prevented it from working with devkitpro release 17. - Fixed even more SWI divide bugs with patch by Mark Winney. - Fixed some bugs in DMA and SWI divide handling allowing a few more games to run (Ruby video demo, Tickle Girl, etc). Fixed some bugs in DMA and SWI divide handling allowing a few more games to run (Ruby video demo, Tickle Girl, etc). Support for the X and Y keys have been added. This can be configured using the Options/Configuration menu option. The code for this was contributed by Normmatt. Many fixes to key handling. Anything but A and B keys were very buggy in previous builds. My 'keys' demo from my tutorials now works correctly and Space Invaders is now playable. Support for GBA games was re-added. It was removed when I first took up support of DSEmu until I understood the code better. It is now back in and will be maintained. The FIFO registers have been implemented. This is an important feature for DSLinux and a step towards support for the commercial downloadable demos. Various bug fixes in graphics code. The compuational accelerator registers have been implemented. Again, a steps towards support for the commerical downloadable demos. Contributed by Julien Hamaide. Workaround for 'console scramble'. There has been an issue since DevkitPro R14 which causes text output using the console output routines to be scrambled. I implemented a workaround in 0.4.6 but it didn't work for homebrew programs built with previous versions. I've been unable to fix the problem so far, so I added a 'Unscramble console text' option in the Options/Configuration menu option. If you run a game and the text appears scrambled, check or uncheck this, and it should correct the problem when you press 'Ok'. I hope to fix this in 0.4.8. DSEmu is an open source Nintendo DS Emulator written by Imran Nazar and released under the BSD License. Unfortunately Imran hasn't been able to continue development of it and on the DSEmu forums he welcomed other people adding to it. Although DSEmu is not very complete it does have at least two things going for it. The first is the source is available. And the second is it has a debugger and stepper built in. So you can step through the ARM7 and ARM9 disassembly which is quite useful. I got the latest source and made a few changes to get it working with some demo programs. It has quite a few limitations still but being able to step through the code, examine the ARM registers, etc has prove quite educational to me. I've made that release, with source, available here for anyone who wants to use it.